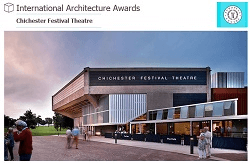 The Chicago Athenaeum: Museum of Architecture and Design and The European Centre for Architecture Art Design and Urban Studies have awarded over 130 new buildings, commercial and institutional developments, landscape architecture, and urban planning projects from 43 nations for The International Architecture Awards for 2016.
the Chichester Festival Theatre Project. The International Architecture Awards are the largest and most extensive global architecture awards program in the world, honouring new skyscrapers, commercial buildings, urban plans, private residences, and real estate projects that achieve a high standard of excellence in design, construction, planning, and sustainability and promote the best practice in all types of real estate development for the private and public sectors, including new skyscrapers, high rises, corporate and institutional buildings, commercial projects, bridges, airports, city planning, restorations and adaptive reuse, community projects, religious and civic buildings, and interiors. Congratulations to Project Architects Haworth Tompkins and all involved in this successful project to enable it to be recognised in this way.